River Valley senior Jaden Neal prepares to attempt a free throw during the fourth quarter of Thursday night’s Tri-Valley Conference contest versus Wellston in Bidwell, Ohio. BIDWELL, Ohio – Turnovers and a barrage of three-pointers by the opposition pillaged the Lady Raiders. 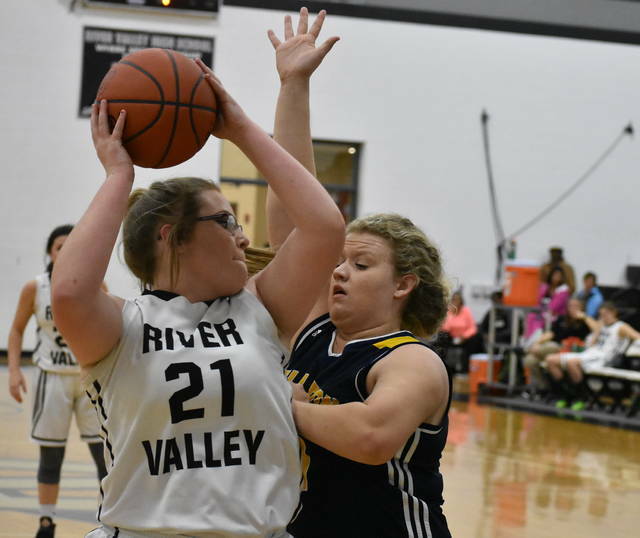 The River Valley girls basketball team committed 23 turnovers as visiting Wellston propelled itself to a 71-38 win on Thursday night in a Tri -Valley Conference Ohio Division contest in Gallia County. The Lady Raiders (0-10, 0-5 TVC Ohio) led the Lady Golden Rockets (7-5, 2-4) for one minute and 33 seconds in the first quarter of play, but two consecutive shots beyond the three-point arc by Wellston began what served as 19-9 run by the visiting Blue and Gold to open the game. River Valley’s Kelsey Brown, Beth Gillman and Carly Gilmore each provided scoring in the game’s first frame, combining for three field goals and three made free throws. However, Wellston’s Sidney Mullins scored 13 of her game-high 33 points in the first frame to provide the Lady Golden Rockets with a 10-point advantage to begin the game’s second quarter. In that second stanza, River Valley sophomore Kaylee Gillman entered the scoring column as she hit two trifectas. 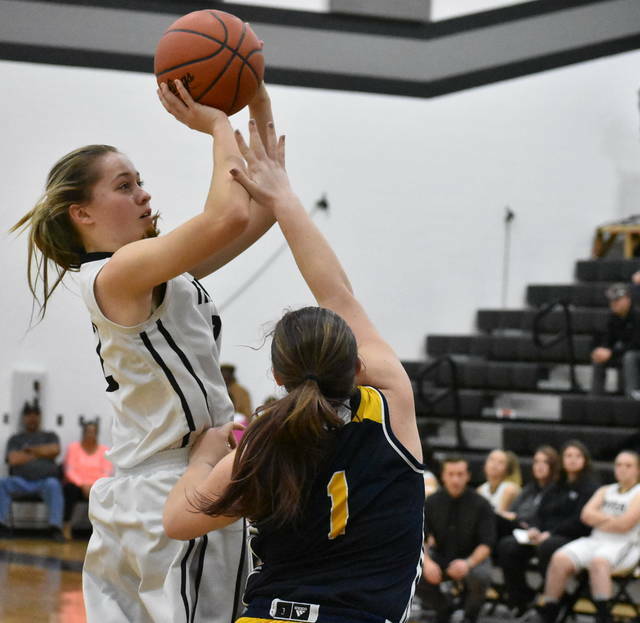 Gillman scored six of the Lady Raiders’ team total of eight points in the second period, as Wellston outscored the Silver and Black 16-8 to enter halftime with a 35-17 advantage. River Valley senior Jaden Neal provided the only other points for the Lady Raiders in the second quarter, as she hit two free throws. While Wellston held the advantage on the scoreboard at intermission, River Valley held the lead in rebounds. The Lady Raiders outrebounded the Lady Golden Rockets 16 to 15 in the first half of play. Unfortunately, RVHS committed 17 turnovers to Wellston’s 11 giveaways in the first half. The game was all Wellston in the second half of action, as the Lady Golden Rockets outscored the Lady Raiders 36-21 in the final two quarters. Overall, RVHS made just 12 of its 51 shots from the field, including four three-pointers. In contrast, WHS shot 33-for-70, and sank nine three-point shots en route to victory. From the free throw line, the Lady Raiders were 10-for-17 for 58 percent. The visiting Lady Golden Rockets were 10-of-18 from the charity stripe for 55 percent. 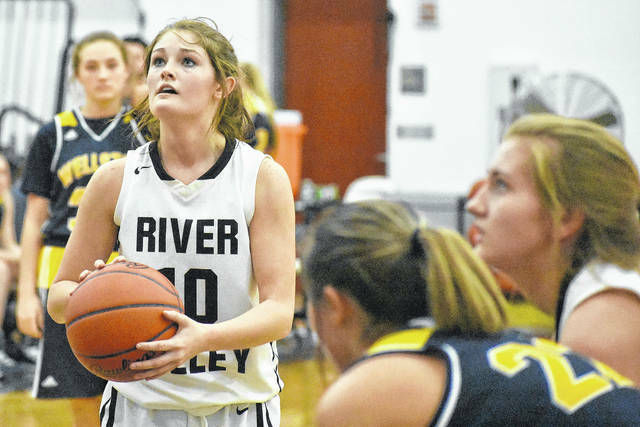 Jaden Neal served as River Valley’s only player to reach double figures in scoring, as she finished with 11 points. Kaylee Gillman provided eight points, which included two three-pointers. RVHS junior Kelsey Brown and senior Carly Gilmore each added six and four points to the scoring column, respectively. Beth Gillman and Hannah Jacks were next as both scored three points, while sophomore Savannah Reese and junior Cierra Roberts rounded out the scoring with two points and one point, respectively. The Lady Raiders will return to the hardwood to face the Point Pleasant Lady Knights on Saturday in Bidwell.